Check out our Facebook Page for quick news and updates. Social media is new to us but the more we write, the more we are inspired to write. 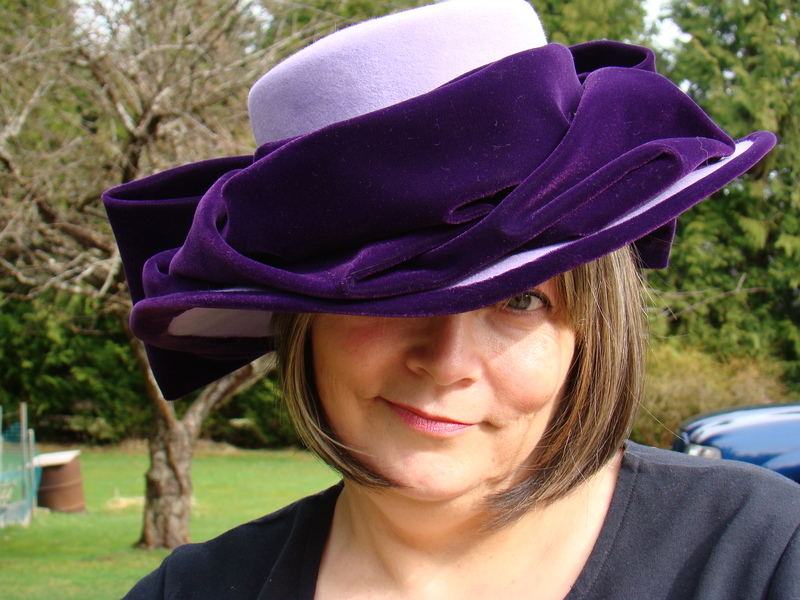 This purple felt hat has a wonderful history. First, William (of Walker Millinery) collaborated with me to stretch and steam, steam and stretch the mauve felt capelin. He was patient and we had lots of laughs while deciding on the size and shape of the finished product. Later, Piroska Meuller (of PM*BC Millinery) spent a day shopping with me to find the perfect velvet for trim. Yes, it was an excuse to have lunch and talk “hats.” Recently, my long-lost friend, Kim, stopped in for a visit, and popped this hat on. WOW! it looked so awesome on her! Next time she visits I will definitely take a photograph of Kim wearing my hat and will post it on Facebook.